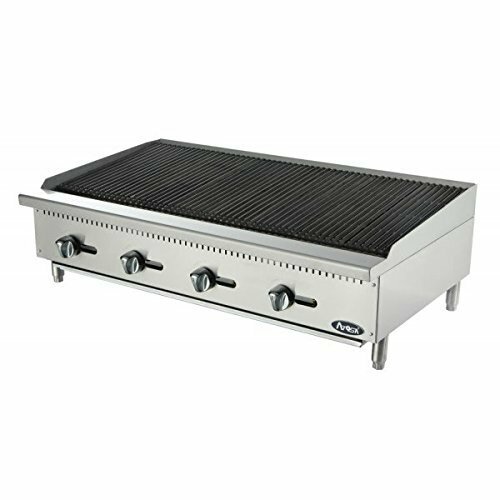 This Atosa ATRC-48 radiant commercial charbroiler is great for grilling a wide range of meats. Featuring (4) highly-efficient stainless steel burners and standby pilots, the heavy-duty charbroiler has adjustable multi-level top grates. Made with corrosion-resistant stainless steel, the countertop charbroiler is durable and easy to clean. Its independent manual controls help reduce energy usage, and adjustable stainless steel legs that enable versatility. A cast iron grill maintains thermal intertia, while thick stainless steel radiant plates ensure quick and even heating. Boasting a simple structure that’s easy to manipulate and maintain, this Atosa ATRC-48 radiant commercial charbroiler measures 16.20"H x 48.00"W x 27.60"D and runs on 140,000 BTUs. View More In Commercial Charbroilers. If you have any questions about this product by Atosa, contact us by completing and submitting the form below. If you are looking for a specif part number, please include it with your message. Crown Verity MCC-60 Outdoor Charbroiler Complete Set - 60"
Crown Verity MCC-72 Outdoor Charbroiler Complete Set - 72"